Some emotional homecomings on Aisling’s first visit to Leitrim, but for how long will its wild beauty remain unspoiled? By Alex McDonnell.Aisling will be 20 next March (2014) and for most of the last two decades we have known Frank well, first when he lived in Arlington House where he spent a lot of his time drinking and hiding away and later when he managed to get through a detox and rehab programme and he was one of the first residents of Stockdale House, the ‘dry’ house near Mornington Crescent between Camden and Euston. This house was managed single-handedly by unsung addiction counsellor Brian Green and it helped to get some of the most chaotic drinkers on the planet to turn their live(r)s around by providing a self-supporting environment. Later Frank was resettled into the community and has been off the booze ever since. In all of that time Aisling has periodically offered Frank the opportunity to come back with us on a return to Ireland trip. About 16 years ago, just as Frank was in hospital undergoing a hip operation his mother died and because he missed the funeral the journey home was put even further back. Later he heard from his mother’s solicitor: as the only child he was entitled to the family home and whatever money his mother left. From then on plans were made and fell through again, the solicitor made enquiries, had a basic survey carried out on the house but little could be done without Franks presence. On this trip, for various reasons we were heading for Co. Leitrim and we would only be a few miles from Franks family home, if it was still standing and Frank finally took the plunge- better late than never. None of us knew much about Drommod but we booked our trip to this destination based on the geographical convenience, not only for Frank but for several others on the trip as well as the great value of the off-peak tariff on the cottages, the position next to the lake, the local amenities and Dervilla Keegan. Dervilla who used to work at the London Irish Centre some years ago before returning to live in Leitrim is deeply involved in the local anti-fracking campaign and hoped that our presence might somehow help to highlight the issues involved – like the threat to the local environment. We had a diverse and intriguing group of wanderers with us, some new and starry eyed arriving like Frank in their homeland for the first time in 30-odd years, others were on their second go, hopefully ready to make the leap into familial connections, peaking behind those long-drawn curtains. For Mary this was a much welcomed return trip after she lost her sister last year and with it her last connection to Ireland. Frances and Jean were old friends and Magdalene laundry survivors who came as a mutually supportive package. They were both unable for the long bus journey and so caught the train from Euston (upgrading to 1st class on the way!) as we were driving up the M1 to collect them at Holyhead. The system worked great although we had a slightly over-stuffed minibus for a couple of hours at the other side going to Leitrim. Drommod is a very small village on Lough Bofin with a couple of pubs and restaurants and a marina below the cottages, which are situated on the side of a hill. The views are great across the lake and an instant calming took effect as we relaxed after the long days drive from London. On Sunday we tend to relax after the exertions of the journey from London but we rose in time to go to mass for those that were (like the Wild Colonial Boy) inclined to Rome. There was no church in Drommod and we were directed to Roosky, about three miles away and drove around for a while before discovering that the nearest Catholic Church was about three miles beyond Drommod in the other direction. We were very late entering and, as ever, like at a comedy show, the only seats available were those at the front of the church so we made a dramatic but dignified entrance. The priest was an American and a diplomat as he gave prayers in support of all the teams playing in the all-Ireland football semi-finals that afternoon. Charlie had researched the local amenities online before we left London and found some excellent reviews for the Copper Still bar and restaurant in Drommod so we decided to book there for our Sunday lunch. Lucky for us we did as the food was wonderful and plentiful and the service efficient and very friendly. They serve every kind of roast dinner plus a couple of fish dishes and some very tasty vegetarian options, all highly recommended. We caught the first half of the Dublin vs Kerry match from the bar trotting out between courses for a closer look, and the second half back at the cottages. The teams were pretty evenly matched with Kerry probably having the edge for most of the game but in stoppage time Dublin got a goal which put them two points ahead and went on to win by 6 points with Kerry giving up the ghost. It was a tremendous match and as we had several Mayo returners with us plus John Glynn and his sister Barbara, who was visiting on her way to Dublin, it was a popular result in our group as the Western People reckoned they had a better chance against Dublin who they would now meet in the final. Because we had a few with us from Mayo our first outing was to Castlebar. Gerry came with us to Wicklow over a year ago and we went to the address he had in Dublin for a brother he hadn’t seen since he left home 40 years ago. Gerry lost confidence outside the house and decided not to go any further. This time Charlie had made contact with another brother who now lived in Roscommon and we arranged to meet in a hotel in Castlebar town but first of all we went to the Irish House pub for a lunch of soup and sandwiches and did some shopping in the town. Patrick was very excited to be back in the town and visited a pub where he had known the owner many years ago. Patrick had worked as a delivery boy when he was young and made regular trips to the pub, located down a steep side street off Market Street in the centre of town. The owner’s wife was there and remembered him from 40 years ago when he was a fresh faced young man. I won’t describe Patrick’s face now but you wouldn’t call it fresh. Later in the day we had arranged with for Tom to meet with his cousins in another hotel in town. A few years ago we had brought Tom with us to Castlebar, after years of persuasion he had eventually agreed to come. He had not been back to the town or indeed to Ireland since the 1960’s. Like Patrick, Tom had worked as a delivery boy for a grocer in Market Street. When we arrived in Castlebar back then Tom was totally disorientated, wandering around looking at the street names and signs not willing to believe his eyes. Tom’s brain could not equate the town now with his memory of it in the 1950’s. It was only when we took him to the church and he walked back on his own could he get a perspective on the place and realised that the street he saw in his mind’s eye, the size and splendour of London’s Oxford Street, was the much reduced and humbler main street where he cycled among the crowds in his youth delivering parcels of groceries. Later that day a few years ago we took Tom up the Windy Gap, just outside of Castlebar where he was born and raised. We stopped at the old national school which was being used as a church for the local community and the old school room was laid out with an altar and all of the accoutrements of a place of worship. 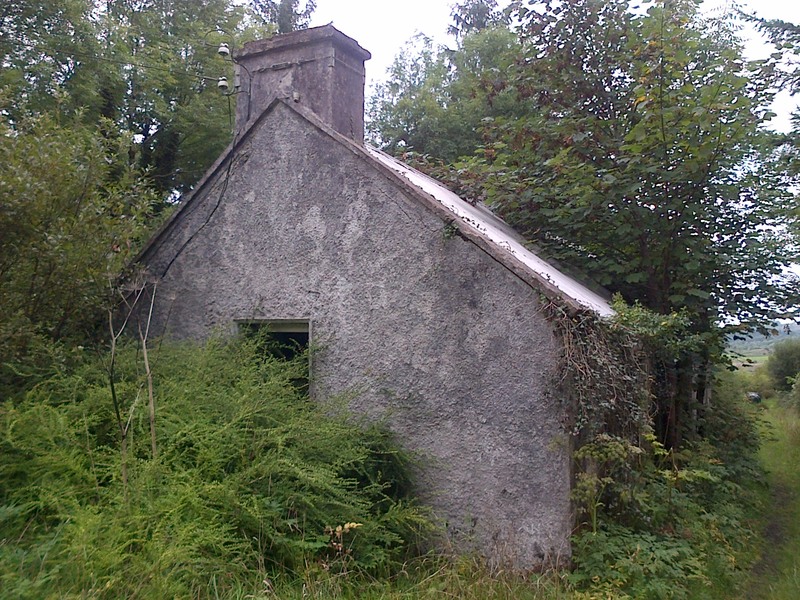 We also went to see the old family house up the gap where Tom had stood as desolate as the lonely old stones of the house left abandoned to the weather but he shied away from contacting his brother in Birmingham who still came home to Mayo every year, or any other member of his family. When we rang his cousins, three sisters who still lived locally and who have had no contact with Tom since 1963, Tom spoke to them briefly on the phone and once again he retreated and said that it was enough just to have spoken to them. The sisters however wouldn’t leave it at that and we took Tom to the hotel where they were waiting for him to catch up on 50 years’ worth of news. Later on the way home on the ferry I spoke to Tom and he asked if I remembered the first time he came with us when we went up the Windy Gap and had I been aware how emotional he was at the time. As it was, I remember clearly the tears streaming down Tom’s face. He said he had tried to hide it from the rest of us and that after so many years it got too much for him. How could I have stayed away so long he asked? Perhaps it got harder each year until it seemed impossible. It’s not so difficult once you make the move he said and this time after meeting his cousins he was starting to get the hang of this homecoming lark. Two brothers and a sister turned up to collect Gerry; they reckoned he had hardly changed and that they would have known him anywhere. Gerry gave me a look as if to say they may not have worn so well and we left them to spend a few days together in Roscommon. The following day Mick’s brother drove up to collect him from Galway where he was to stay for most of the week. Our merry band was diminishing dramatically. We drove up to Kiltyclogher to meet Dervilla, driving into the deserted square where the stone statue of Sean McDiarmada was the only person visible, there was only one car too and that belonged to Niall Delaney from Ocean FM Radio. 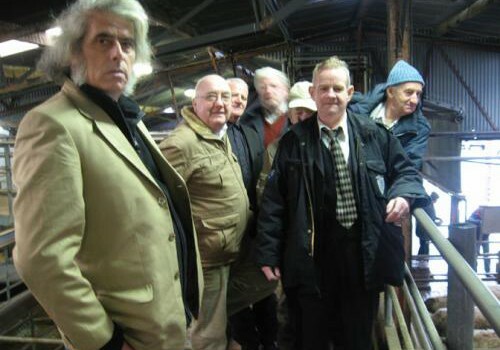 Niall had been invited to interview us courtesy of Dervilla who was waiting for us up at the McDiarmada house. As we drove down the tiny boreens of North Leitrim it began to rain and as we arrived outside the family home of one of Ireland’s greatest republican heroes it was pelting down. draped over his damp shoulders. own past. Jim told us tales of North Leitrim, the McDiarmada family and Sean’s exploits in the war of independence and his cruel execution in Kilmainham jail. In three years’ time we will be celebrating the centenary of the Rising, let’s hope the house gets many visitors. community centre where we had refreshments and listened to the story of this centre of local community empowerment and some fine tunes complete with related tales and reflections from Rossa O’Snoddaigh one of the fine musicians from the very successful folk group Kila. Dervilla is very involved in the anti-fracking movement and before we left North Leitrim we were wearing t-shirts (Tourism Not Fracking) and sporting badges (Football Not Fracking) against the dodgy practice. The minibus wasn’t left out either and we still have a sticker on the back of the van saying, ‘Farming Not Fracking’. As this was my first visit I was very impressed with the wild beauty of North Leitrim and by my reckoning and after discussions with Dervilla I feel it would be a tragedy if it was to be despoiled for the sake of a small amount of fuel enriching a small amount of people. As you will know from these stories Aisling clients don’t make it home that often but when they do, and it’s true of the many exiles who come home regularly, they want to see again the beauty of the landscape as they remembered it just as visitors from the whole world who hear of the green glory of the Irish countryside and come to visit. Will tour bus loads of Irish Americans from generations past want to come to the Ireland of their dreams if it looks more like the industrial wasteland of Detroit? It’s ironic too that fracking is being proposed as a solution to the energy needs of the country at the same time as Irish people are being arrested for cutting turf on their own land, others have been locked up for protesting the environmental damage of oil exploration (with no financial benefit to the nation) and Bord na Mona are closing down their power stations at the behest of Europe. As we were leaving the McDiarmada house Jim presented Frank with a sod of turf, a symbol if there ever was one of the traditional Ireland modern politicians seem to have little regard for. Driving back to Drommod that day I noticed posters on the roadside from the Fine Gael party supporting the undemocratic abolition of the Seanaid with the slogan, ‘the fewer politicians the better’. If they don’t trust themselves what hope is there for the rest of us? At last Frank got to meet Mr Wynn, his mother’s solicitor. Wynn’s office is in a light and airy modern glass building looking tastefully out of place in Boyle Co. Roscommon. He is every inch the country family solicitor and is looking extremely fit for his age as he must be well in to his 70’s. Frank is in his 60’s and couldn’t make it up the stairs so we met in a bright meeting room on the ground floor. The solicitor brought with him a file about a foot thick. Frank, John Glynn and I introduced ourselves, we were all known to each other from the years of dealing with Frank’s case but had never met before now. Leafing through the hefty documents, including correspondence with the surveyor, plans of the house and maps of the surrounding area it became apparent that there was a whole lot of history in those files and Frank was becoming emotional as the meeting went on. While we were with the solicitor the rest of our returners were getting to know Boyle. King House the local landlord’s seat is the main tourist attraction and otherwise there are good shopping opportunities (the charity shops were popular with our gang) and nice river walks. On the day we visited we saw the comedy genius Johnny Vegas dressed in a one-piece furry animal costume standing on the bridge with the furry head in his hand having a break. Bits and pieces of outdoor film paraphernalia were scattered around the road as the crew waited for Johnny to finish his fag. Apparently Johnny features in the RTE series, ‘Moone Boy’ which they film here. Elsewhere in the North-West at the same time Ken Loach was making what may be his last film about a socialist revolutionary dance hall owner in the 1920’s, so this is all great for the local economy suggesting a new slogan for Dervilla: ‘Filming not Fracking’. We spent a great day in Carrick on Shannon including lunch in a fresh bake house that smelt of all our yesterdays, a visit to a magical and very expensive second hand-bookshop with a grumpy and preoccupied proprietor whose unhelpful demeanour lost him a few sales that day and we took turns visiting the smallest chapel in the world, a sort of mini Taj Mahal. Before we left we sat in the sunshine on the banks of the Shannon chatting about this and that relaxed and contented by the swift flow of water and the jolly traffic on Ireland’s greatest waterway. Another day we spent at Lough Key national park, which features all sorts of exciting outdoor activities including boating, climbing, tree hopping etc. We settled for a stroll in the forest during which it started to pelt with rain again and we took refuge in a grove of Red Cedars, which turned out to be a very special place. The sinuous trunks reached up to the sky above us and below there was a carpet of shed needles. Twisted branches snaked low enough to the ground to sit and we were bathed in a warm red glow. It was like being in a cathedral and we couldn’t have heard a pin drop never mind the rain tipping down outside. At last Frank made it home after all his wild years. It was a hard slog up the rutted track through the forest where no van could go on his two crutches but he was spurred on by the will to see his old house once again. That it was overgrown and dilapidated didn’t seem to bother him so much nor that the roof was caving in and the windows and doors were broken but in the hallway when he saw his mother’s old coat was still hanging on the coat peg he had an emotional moment. There were reminders everywhere of the life he lived here with his family all those years ago before he took the boat to England with hopes and dreams not thinking he would be gone so long. He gathered up memories and souvenirs of his home years, his father’s gardening hat, an old religious statue, family photos and newspaper cuttings of his days on the football field and closed the door leaving the old house to the forest. Down in the valley he found his aunt’s house and she was expecting him; word had got around on the grapevine. Cousins arrived with their sons and daughters to see the wanderer they had only heard about. It was a grand homecoming and a relief that there was a second act to the drama after the loneliness of that empty house.